The earliest known publication of the term mouse as a computer pointing device is in Bill English's 1965 publication "Computer-Aided Display Control". 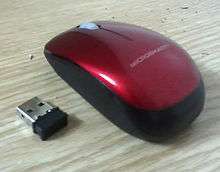 Both the online Oxford Dictionaries and Merriam-Webster entries for mouse state the plural for the small rodent is mice, while the plural for the small computer connected device is either mice or mouses. The Oxford dictionary's usage section states that the more common plural is mice and claims the first recorded use of the plural is mice (though it cites a 1984 use of mice when there were actually several earlier ones, such as J. C. R. Licklider's "The Computer as a Communication Device" of 1968). According to the fifth edition of The American Heritage Dictionary of the English Language the plural can be either "mice" or "mouses". The trackball, a related pointing device, was invented in 1941 by Ralph Benjamin as part of a World War II-era fire-control radar plotting system called Comprehensive Display System (CDS). Benjamin was then working for the British Royal Navy Scientific Service. Benjamin's project used analog computers to calculate the future position of target aircraft based on several initial input points provided by a user with a joystick. Benjamin felt that a more elegant input device was needed and invented what they called a "roller ball" for this purpose. DATAR was similar in concept to Benjamin's display. The trackball used four disks to pick up motion, two each for the X and Y directions. Several rollers provided mechanical support. When the ball was rolled, the pickup discs spun and contacts on their outer rim made periodic contact with wires, producing pulses of output with each movement of the ball. By counting the pulses, the physical movement of the ball could be determined. A digital computer calculated the tracks, and sent the resulting data to other ships in a task force using pulse-code modulation radio signals. This trackball used a standard Canadian five-pin bowling ball. It was not patented, as it was a secret military project as well. On 2 October 1968, a mouse device named Rollkugel (German for "rolling ball") was described as an optional device for its SIG-100 terminal that had been developed by the German company Telefunken. As the name suggests and unlike Engelbart's mouse, the Telefunken model already had a ball. It was based on an earlier trackball-like device (also named Rollkugel) that was embedded into radar flight control desks. This trackball had been developed around 1965 by a team led by Rainer Mallebrein at Telefunken Konstanz for the German Bundesanstalt für Flugsicherung as part of their TR 86 process computer system with its SIG 100-86 vector graphics terminal. When the development for the Telefunken main frame TR 440 began in 1965, Mallebrein and his team came up with the idea of "reversing" the existing Rollkugel into a moveable mouse-like device, so that customers did not have to be bothered with mounting holes for the earlier trackball device. Together with light pens and trackballs, it was offered as optional input device for their system since 1968. Some Rollkugel mouses installed at the Leibniz-Rechenzentrum in Munich in 1972 are well preserved in a museum. Telefunken considered the invention too small to apply for a patent on their device. Independently, Douglas Engelbart at the Stanford Research Institute (now SRI International) invented his first mouse prototype in the 1960s with the assistance of his lead engineer Bill English. 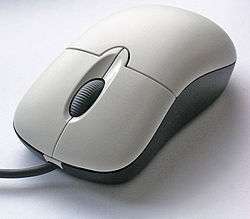 They christened the device the mouse as early models had a cord attached to the rear part of the device looking like a tail and generally resembling the common mouse. A few months after Telefunken started to sell the Rollkugel, Engelbart released his demo on 9 December 1968. 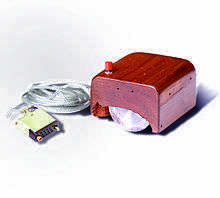 Engelbart never received any royalties for it, as his employer SRI held the patent, which ran out before it became widely used in personal computers. The invention of the mouse was just a small part of Engelbart's much larger project, aimed at augmenting human intellect via the Augmentation Research Center. Several other experimental pointing-devices developed for Engelbart's oN-Line System (NLS) exploited different body movements – for example, head-mounted devices attached to the chin or nose – but ultimately the mouse won out because of its speed and convenience. The first mouse, a bulky device (pictured) used two potentiometers perpendicular to each other and connected to wheels: the rotation of each wheel translated into motion along one axis. 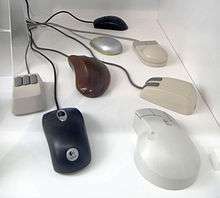 At the time of the "Mother of All Demos", Englebart's group had been using their second generation, 3-button mouse for about a year. The Xerox Alto was one of the first computers designed for individual use in 1973, and is regarded as the grandfather of computers that utilize the mouse. Inspired by PARC's Alto, the Lilith, a computer which had been developed by a team around Niklaus Wirth at ETH Zürich between 1978 and 1980, provided a mouse as well. The third marketed version of an integrated mouse shipped as a part of a computer and intended for personal computer navigation came with the Xerox 8010 Star Information System in 1981. By 1982 the Xerox 8010 was probably the best-known computer with a mouse, the Sun-1 did also come with a mouse and the forthcoming Apple Lisa was rumored to use one, but the peripheral remained obscure; Jack Hawley of The Mouse House reported that one buyer for a large organization believed at first that his company sold lab mice. Hawley, who manufactured mice for Xerox, stated that "Practically, I have the market all to myself right now"; a Hawley mouse cost $415. 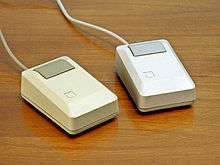 That year Microsoft made the decision to make the MS-DOS program Microsoft Word mouse-compatible, and developed the first PC-compatible mouse. 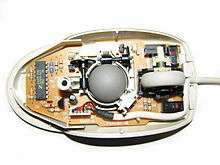 Microsoft's mouse shipped in 1983, thus beginning the Microsoft Hardware division of the company. However, the mouse remained relatively obscure until the appearance of the Macintosh 128K (which included an updated version of the Lisa Mouse) in 1984, and of the Amiga 1000 and the Atari ST in 1985. The relative movements of the mouse on the surface are applied to the position of the pointer on the screen, which signals the point where actions of the user take place, so that the hand movements are replicated by the pointer. Clicking or hovering (stopping movement while the cursor is within the bounds of an area) can select files, programs or actions from a list of names, or (in graphical interfaces) through small images called "icons" and other elements. For example, a text file might be represented by a picture of a paper notebook, and clicking while the cursor hovers this icon might cause a text editing program to open the file in a window. The computer industry often measures mouse sensitivity in terms of counts per inch (CPI), commonly expressed as dots per inch (DPI) – the number of steps the mouse will report when it moves one inch. In early mice, this specification was called pulses per inch (ppi). The Mickey originally referred to one of these counts, or one resolvable step of motion. If the default mouse-tracking condition involves moving the cursor by one screen-pixel or dot on-screen per reported step, then the CPI does equate to DPI: dots of cursor motion per inch of mouse motion. The CPI or DPI as reported by manufacturers depends on how they make the mouse; the higher the CPI, the faster the cursor moves with mouse movement. However, software can adjust the mouse sensitivity, making the cursor move faster or slower than its CPI. Current software can change the speed of the cursor dynamically, taking into account the mouse's absolute speed and the movement from the last stop-point. In most software, an example being the Windows platforms, this setting is named "speed," referring to "cursor precision". However, some operating systems name this setting "acceleration", the typical Apple OS designation. This term is incorrect. Mouse acceleration in most mouse software refers to the change in speed of the cursor over time while the mouse movement is constant. After id Software's commercial hit of Doom, which did not support vertical aiming, competitor Bungie's Marathon became the first first-person shooter to support using the mouse to aim up and down. Games using the Build engine had an option to invert the Y-axis. The "invert" feature actually made the mouse behave in a manner that users now regard as non-inverted (by default, moving mouse forward resulted in looking down). Soon after, id Software released Quake, which introduced the invert feature as users now know it. ↑ "Definition for Mouse". 2011. Retrieved 2011-07-06. ↑ J. C. R. Licklider (April 1968). "The Computer as a Communication Device" (PDF). Science and Technology. ↑ "mouse". Houghton Mifflin Harcourt. Retrieved 25 August 2013. 1 2 Copping, Jasper (2013-07-11). "Briton: 'I invented the computer mouse 20 years before the Americans'". The Telegraph. Retrieved 2013-07-18. 1 2 Hill, Peter C. J. (2005-09-16). "RALPH BENJAMIN: An Interview Conducted by Peter C. J. Hill" (Interview). Interview #465. IEEE History Center, The Institute of Electrical and Electronics Engineers, Inc. Retrieved 2013-07-18. ↑ Vardalas, J. (1994). "From DATAR to the FP-6000: Technological change in a Canadian industrial context". IEEE Annals of the History of Computing. 16 (2): 20–30. doi:10.1109/85.279228. ↑ "FP-6000 -- From DATAR To The FP-6000". ieee.ca. 1 2 3 "Auf den Spuren der deutschen Computermaus" [In the footsteps of the German computer mouse] (in German). Heise Verlag. 2009-04-28. Retrieved 2013-01-07. ↑ "SIG-100 video terminal and mouse". ↑ ""Mouses" vs "mice"". alt.usage.english fast-access FAQ. Retrieved 2006-06-11. ↑ Maggie, Shiels (2008-07-17). "Say goodbye to the computer mouse". BBC News. Retrieved 2008-07-17. ↑ "The Demo That Changed the World". Smithsonian Channel. Retrieved 3 January 2013. ↑ "first mouse – CERN Courier". cerncourier.com. Retrieved 2015-06-24. ↑ Engelbart, Christina. "Display-Selection Techniques for Text Manipulation - 1967(AUGMENT,133184,) - Doug Engelbart Institute". dougengelbart.org. Retrieved 2016-03-15. ↑ Markoff, John (1982-05-10). "Computer mice are scurrying out of R&D labs". InfoWorld. pp. 10–11. Retrieved 26 August 2015. ↑ "30 Years Of Microsoft Hardware". Microsoft. Retrieved 15 July 2012. ↑ Dvorak, John C (1984-02-19). "The Mac Meets the Press". The San Francisco Examiner. 1 2 "How to Use Your Computer Mouse". dummies.com. Retrieved 11 December 2013. ↑ "Doug Engelbart: Father of the Mouse (interview)". Retrieved 2007-09-08. ↑ Wadlow, Thomas A. (September 1981). "The Xerox Alto Computer". Byte. 6 (9): 58–68. 1 2 "The Xerox Mouse Commercialized". Making the Macintosh: Technology and Culture in Silicon Valley. ↑ "Hawley Mark II X063X Mouses". oldmouse.com. ↑ "Honeywell mechanical mouse". Archived from the original on 2007-04-28. Retrieved 2007-01-31. ↑ "Honeywell mouse patent". Retrieved 2007-09-11. ↑ "Keytronic 2HW73-1ES Mouse". Retrieved 2007-01-31. ↑ "Retrieved 31 December 2006". News.softpedia.com. 1970-11-17. Retrieved 2010-05-29. ↑ "Inventions, computer mouse – the CNN site". Archived from the original on April 24, 2005. Retrieved 2006-12-31. 1 2 "Computer mouse inventor dies in Vaud". World Radio Switzerland. 2009-10-14. Retrieved 2009-10-28. ↑ Denise Caruso (May 14, 1984). "People". InfoWorld. InfoWorld Media Group, Inc. 6 (20): 16. ISSN 0199-6649. ↑ Fresh Patents – Highly Sensitive Inertial Mouse. Retrieved 31 December 2006. ↑ Doug A. Bowman, Ernst Kruijff and Ivan Poupyrev (2005). 3D user interfaces. Addison-Wesley. p. 111. ISBN 978-0-201-75867-2. ↑ Stephen F. Krar and Arthur Gill (2003). Exploring advanced manufacturing technologies. Industrial Press Inc. pp. 8–6–4. ISBN 978-0-8311-3150-0. ↑ "Retrieved 31 December 2006". Byte.com. Retrieved 2010-05-29. ↑ "Space Ball". Vrlogic.com. Retrieved 2010-05-29. ↑ "axsotic". axsotic.de. Retrieved 2011-02-09. ↑ "Computer based platform for tactile actuator analysis". Actuator'06, Bremen. 14–16 June 2006. ↑ "Digitizer tablet Definition". PC Magazine. Retrieved 19 October 2015. ↑ "Evoluent VerticalMouse Vertical Mouse ergonomic mouse ergonomic computer mouse carpal tunnel syndrome repetitive stress disorder RSI". evoluent.com. ↑ Product Specialists. "Handshoe Mouse (Original)". ergocanada.com. ↑ McCracken, Harry. "Confessions of a Left-Handed Technology User". Time. Retrieved 15 August 2015. 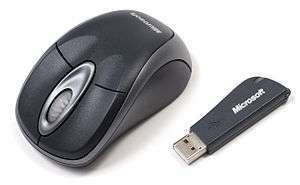 ↑ "Windows 8 How-to: Mice". Microsoft Hardware. Microsoft. ↑ "Proper use and purpose of mouse weights". Super User. Retrieved 2013-03-10. ↑ "Mad Catz R.A.T. 9 Product Page:". Retrieved 25 December 2014. ↑ Thomas Adams. "Peripheral Vision: Logitech G600 MMO Gaming Mouse". GameZone. Retrieved 2013-08-09. ↑ "PC Gaming 101: Mouse Grip Styles". Digital Storm Online, Inc.
↑ "The palm grip". Ergonomics guide. Razer. Retrieved 12 August 2013. ↑ "The claw grip". Ergonomics guide. Razer. Retrieved 12 August 2013. ↑ "The fingertip grip". Ergonomics guide. Razer. Retrieved 12 August 2013. 1 2 Interfacing to mouse.sys Accessed 2011-10-08. ↑ Shawn Hargreaves et al. Allegro manual: Mouse routines. Accessed 2011-10-08. ↑ FreeDOS-32 – Serial Mouse driver Archived March 2, 2009, at the Wayback Machine. ↑ Adam Chapweske. "Computer Engineering Tips – PS/2 Mouse Interface". Computer-engineering.org. Retrieved 2013-03-10. ↑ Retrieved 31 December 2006 Archived April 8, 2008, at the Wayback Machine. ↑ "Retrieved 31 December 2006". Win.tue.nl. Retrieved 2010-05-29. ↑ Jon Gan (November 2007). "USB: A Technological Success Story". HWM. SPH Magazines: 114. ISSN 0219-5607. ↑ "Multipoint Mouse SDK". Microsoft. Retrieved 2012-08-05. ↑ Nakamura, S.; Tsukamoto, M.; Nishio, S. (26–28 August 2001). Design and implementation of the double mouse system for a Window environment. IEEE Pacific Rim Conference on Communications, Computers and Signal Processing. 1. IEEE. pp. 204–207. doi:10.1109/PACRIM.2001.953558. ↑ "Pointer ballistics for Windows XP". Windows Hardware Developer Center Archive. Microsoft. 2002. Retrieved April 29, 2010. ↑ Eric "Unit24" Guy. "Corepad Victory & Deskpad XXXL". Retrieved 2007-10-03. ↑ Andrew Chan (Nov 2004). "The Macintosh Phenomenon: Celebrating Twenty Years of the World's Most Adored Desktop Computers". HWM: 74–77. ↑ Booth, Stephen A. (Jan 1987). "Colorful New Apple". Popular Mechanics. 164 (1): 16. ISSN 0032-4558. ↑ Shiels, Maggie (2008-12-03). "Logitech's billionth mouse". BBC News. Retrieved 2010-05-29. ↑ Mace, Scott (1984-05-07). "In Praise of Classics". InfoWorld. p. 56. Retrieved 6 February 2015. ↑ "Glossary:Mouse acceleration – PCGamingWiki PCGW – bugs, fixes, crashes, mods, guides and improvements for every PC game". PCGamingWiki. Retrieved 26 July 2015. ↑ BGM Team. "Zero Acceleration: Much better option and settings for First-person shooter". ↑ "First Use of Freelook in a FPS". Guinness World Records. Retrieved 17 October 2015. ↑ Casey Phillips (19 August 2011). "Super Nostalgia: Local Gamers Fondly Remember Super Nintendo on Its 20th Anniversary". Times Free Press. Retrieved 18 October 2015.